SEIU ball: I met Moby! He’s the coolest vegan I know, and about as intimidating as a kindly musical uncle. I chatted with him near the dance floor, and he intimated that he’s now been been a faithful dairy-and-egg-free eater for 22 years. Other good stuff: Our view of the paintings and installations at Manifest Hope: DC in Georgetown was lubricated by free Belvedere and Honest Tea. Ritsy vodka and the nummy brain children of a couple of nice Jewish boys isn’t a bad combo, especially when swizzled with art inspired by the election and ideals of Barack Obama. 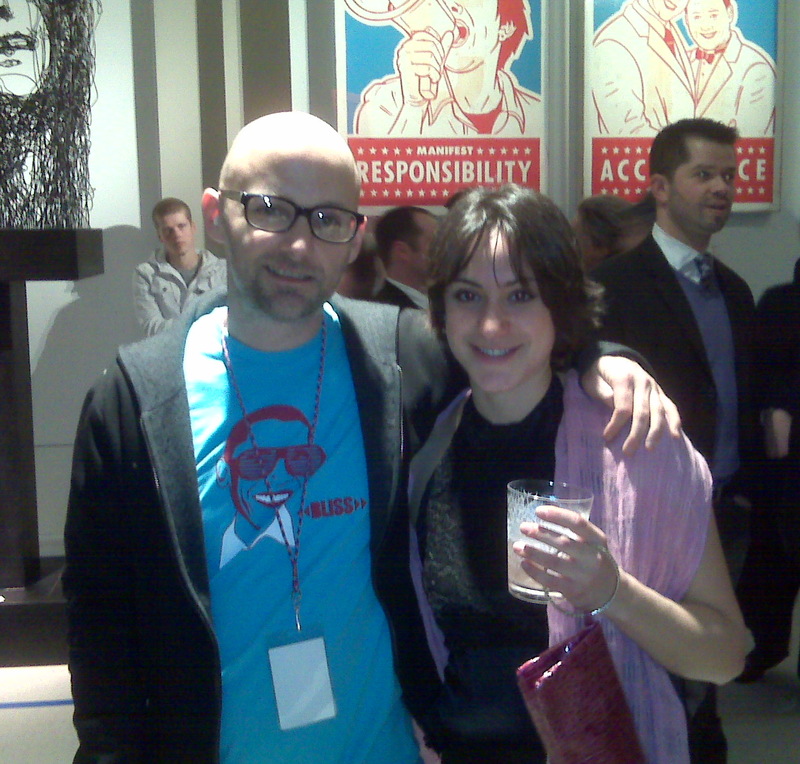 Also, did I mention I met Moby? 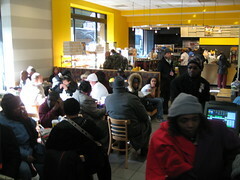 The pre-Mall pitstop:We stopped at Au Bon Pain at H and North Capitol around 10 a.m. to find it packed and buzzing with anticipation. The most popular items were coffee, hot soup, and breakfast sandwiches. I grabbed some mixed nuts and water–what I thought would best compliment the next few hours of cold and little access to toilettes. The place held a broad mix of ages, races, and levels of sleepiness. There were people decked out in Obama gear and security officers in uniform, and then our little bundled up group of four (I represented in my red hat with “OBAMA” sequined across the front). The pitstop was essential, as we had a long walk and lots of cheering ahead of us. [NEW] The culinary habits of mall rats: We didn’t start out terribly early, so we didn’t have to wait around on the mall much, but we did burn off a lot of calories with the walking. 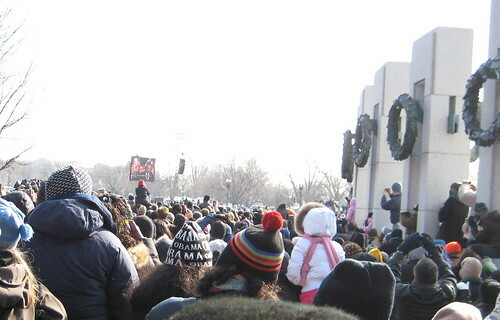 So we did some snacking in our spot by the WWII memorial as we watched the swearing-in on the westernmost Jumbotrons. Willie ate an apple that became his last meal of the Bush Era. I ate my mixed nuts–my own little gesture toward that period. The sandwiches I didn’t eat: I learned that you should not stop at Remington’s on Pennsylvania Ave. after six hours of walking in the freezing cold and watching Obama get sworn in–at least if you want some tasty and warm vegetarian food, or even something on a plate. They had a small selection of non-veggie subs served wrapped in plastic with a side of chips. If you wanted just chips, no dice. Also, the wine and beer were served in glasses that I suspect were taken from Mini Me’s kitchen cabinet and a Lilliputian frat party, respectively. The sandwich I did eat: The Argonaut on H Street Northeast came through. Though they’d had a fire in their grill, we eventually managed to get a decent meal. Mine was grilled cheese and tomato on peasant bread, with shared sweet potato and garlic fingerling potato fries and a normal-sized glass of shiraz. As the Obamas headed to a five-star dinner in a grand ballroom, we settled into the dim nautical ambiance and enjoyed our first meal of a new era. omfg.. it’s moby!! sorry… that’s all i noticed…. i promise i will read the entire blog once im done commenting! Ha! Lemme know what you think of the rest of it! Rhea, seriously, KY should make you an official colonel! 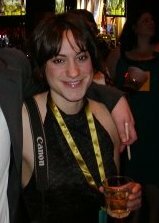 I am so jealous you got to go to the inauguration! Was all the craziness worth it?